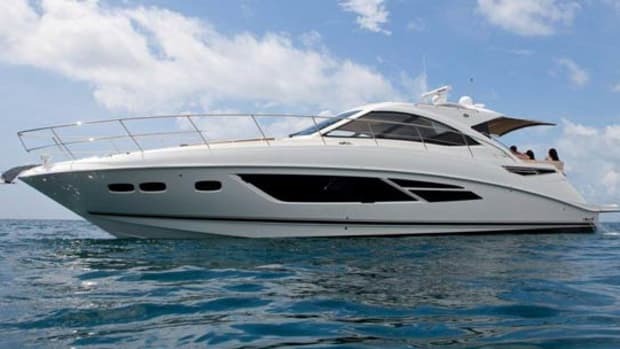 Ten years after its debut, the Sea Ray 580 Sundancer continues to appeal to those who want to cruise in luxury and comfort. Maybe it’s her sinuous lines, which make her seem to be moving gracefully and powerfully through the water, even when she is just idling along. Maybe it’s the acres of teak planking on the bridgedeck and at the twin stairways leading down to the swim platform. Or maybe it’s the incredible sightlines from the helm under the hardtop. 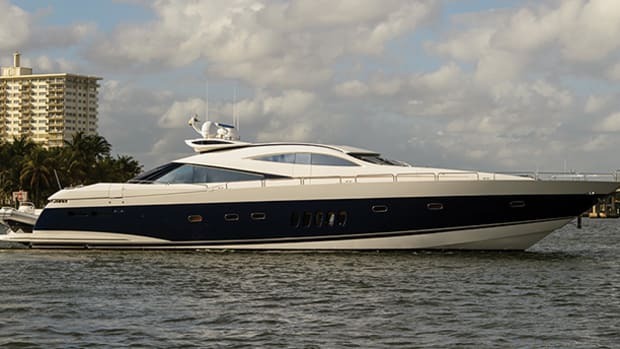 All of these things make the Sea Ray 580 Sundancer QQ Cumberas a distinctive cruising yacht. 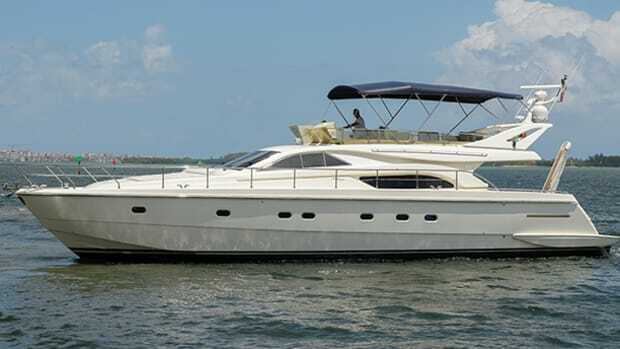 When this model debuted in 2008, the Sea Ray 580 Sundancer was hailed as a breakthrough boat for a builder that had been producing mostly conservative designs in the years leading up to her launch. 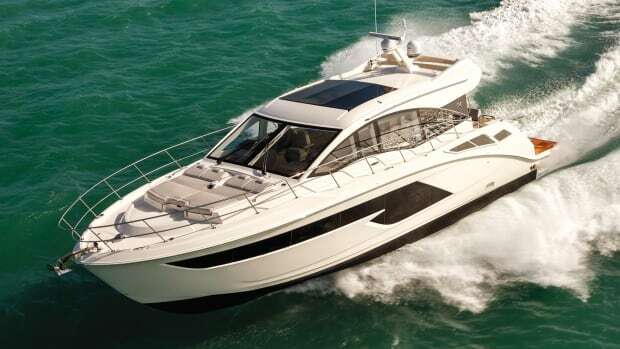 Despite the fact that the nation’s economy was slowing down and boat sales were beginning to sag, Sea Ray was determined to push ahead with this $1-million-plus cruiser. 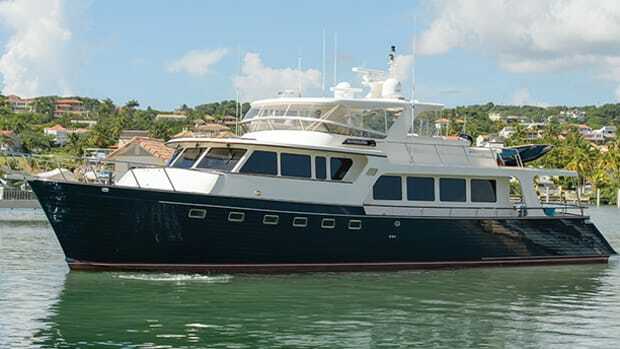 It was the Tennessee-based manufacturer’s response to the success some European builders were having in the American marketplace, having lured U.S. yachtsmen with continental flair and luxury accommodations. 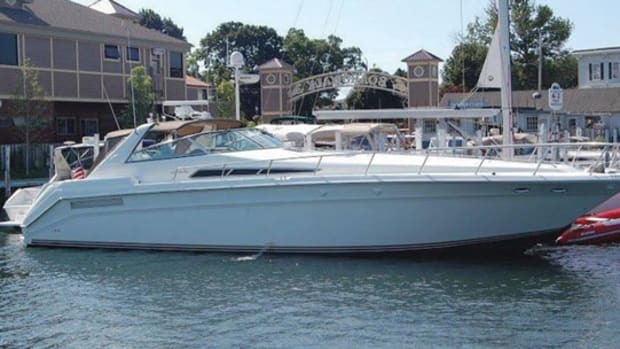 After decades of playing it safe, the 580 Sundancer was a breath of fresh air for Sea Ray aficionados. 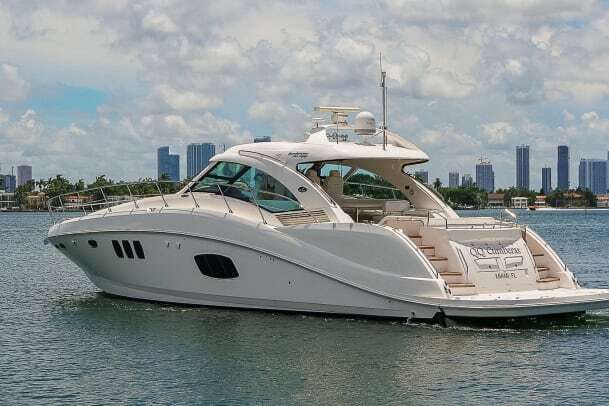 “The 580 Sundancer (called the 55 Sundancer in 2008–09) took the Sea Ray concept of elegance and sophistication to the next level when she was introduced in 2008,” writes Ed McKnew in The 2017 Powerboat Guide. 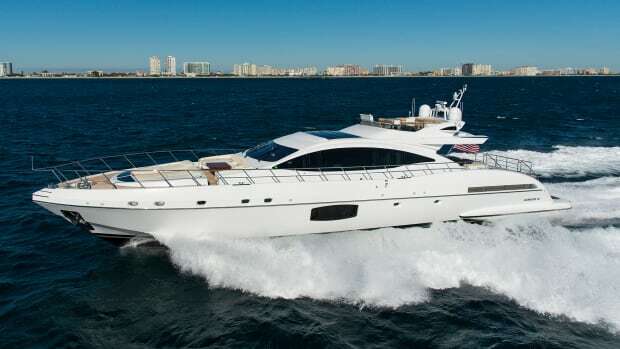 Noftsinger said the one (and only) owner of QQ Cumberas had performance in mind when he ordered his 580 Sundancer with twin 1,100-horsepower MAN diesels, a powerful upgrade from the standard 900-horsepower MANs (capable of 25-knot cruising speeds and 30-knot top speeds), plus a more powerful 21-kilowatt Onan generator for the 38,000-Btu cabin air handlers and 40,000-Btu bridgedeck air handlers. The modified-V hull with a 17-degree transom deadrise was perfect for the original owner, who liked cruising the waters along the Florida coast and the Keys, and making the crossing to the Bahamas, where the boat’s 60-gph Sea Recovery watermaker ensured a constant source of fresh water for the comfort of all aboard. 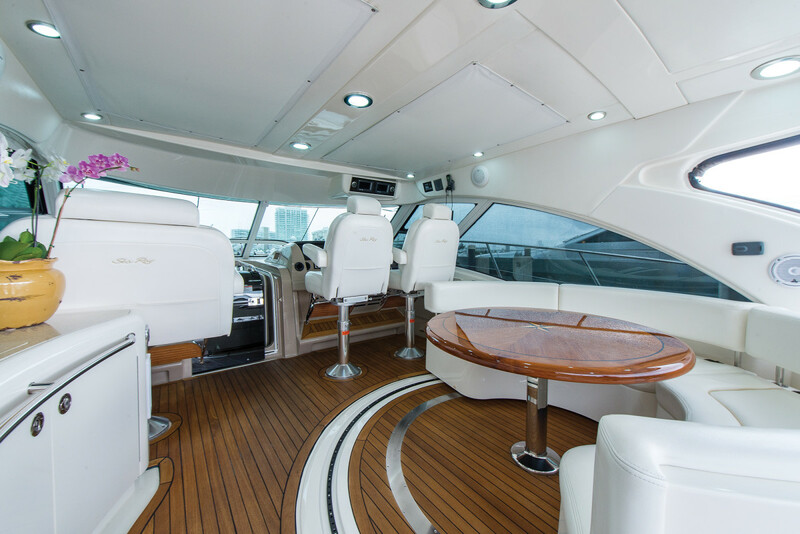 Sea Ray’s designers gave the 580 Sundancer a wealth of outdoor relaxation spaces on the bridgedeck, from the built-in outdoor seating aft to the protected seats under the sculptural hardtop. At the helm, there are two fully adjustable chairs with armrests to starboard and a double companion bench seat to port. The semi-circular seating abaft the helm is really a pair of two-person benches with stowage in the fiberglass bases. Seats are mounted on a track so you can reposition benches to face forward or aft around a glossy circular table. The flexibility makes this feature great for entertaining. As for the hardtop with glass enclosure on three sides, it offers excellent views and is equipped with two independent, opening sunroof panels (with retractable sunshades) for more ventilation when desired. There’s also an isinglass panel that you can use to close off the aft end of the bridge when air conditioning is warranted. 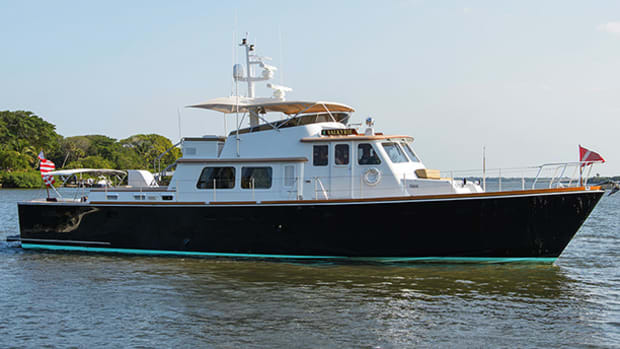 This yacht was further enhanced with a hydraulic swim platform that’s great for water sports; it’s covered with teak planking, so it feels good under bare feet, even in the hot Florida sun. A host of outdoor entertainment options include an outdoor grill, wet bar with refrigerator and freezer, and a large outdoor TV. There are an impressive number of stainless steel handrails for safety. A rotating settee on the bridgedeck is a design gaining momentum in boats today. Extra thought was given to the helm layout, and the owner did not skimp when choosing electronics. A pair of Raymarine G150 color MFDs (connected to a 4-kilowatt Raymarine open-array radar) dominate the dash just ahead of the adjustable steering wheel, and they’re perfectly positioned for at-a-glance updates of navigation information. Closed-circuit cameras provide views of the engine room and cockpit. The digital twin-engine binnacle is located just to the right of the wheel, and the switches controlling the 24-volt DC Side-Power bow and stern thrusters are to the left—well separated so that the use of one system prevents accidental actuation of the other. Rocker switches are moved to a flat outboard of the helm, and the twin MAN engine and gearbox data screens are located above the helm. Likewise, the VHF radio is located above and outboard of the starboard helm seat. While the spacious outdoor living and entertaining areas of the 580 Sundancer are highly appealing, it’s the luxurious interior that’s really impressive. It is seven steps from the sliding acrylic cabin door to the luxurious salon below. High-gloss cherry cabinetry, Corian countertops, and stainless steel appliances dominate the U-shaped galley on the port side of the salon, with maplewood-planked floors tying the galley together with the comfortable dining area to starboard with Ultra-leather lounge. The electrical panel is behind a frosted-glass door just to the right of the steps as you descend—easy to access. Wooden blinds offer privacy or lots of natural light through hullside windows on both sides of the salon. Headroom is roughly 6 feet 8 inches throughout the interior, adding to the sense of spaciousness that is usually found in much larger yachts. Those passengers seated on the starboard lounge can watch a large LCD television screen installed on the side of the bar along the centerline. A Bose Lifestyle sound system and media center enable the entertainment. 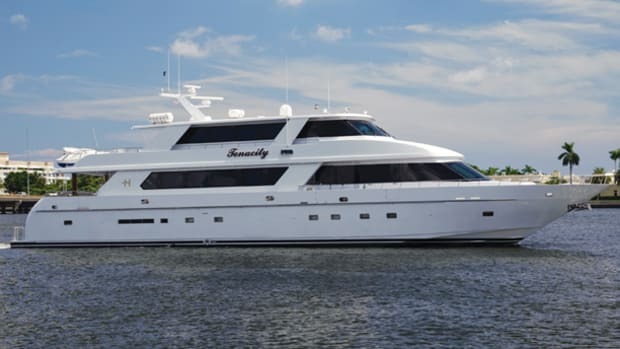 The galley has some notable features, including Vitrifrigo under-counter refrigerator and freezer units, a Whirlpool washer/dryer combo, a deep Kohler stainless steel sink with Hansa custom faucet, a recessed three-burner cooktop with overhead vent, and a convection/microwave oven. A prominent stainless steel handrail between the sink and the Vitrifrigo units makes preparing meals under way that much safer. In the master stateroom, there’s a queen-size berth and a private sitting area with a nice view. Solid cherry wood doors with a high-gloss finish lead to the guest stateroom forward and the master stateroom amidships. 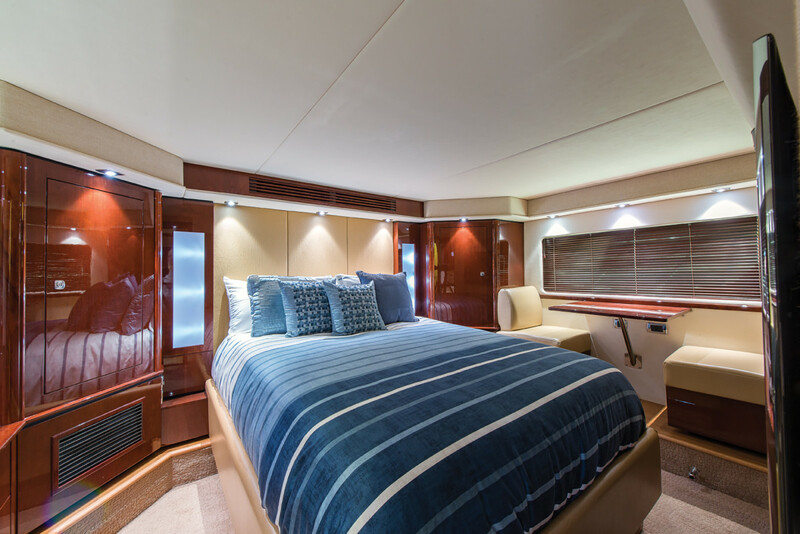 The master has a private head compartment while the forward stateroom has a private entry to the second head, which also serves as the dayhead with access for guests from the passageway. The guest stateroom features a queen-size island berth, and an overhead hatch for natural light and ventilation, plus a separate shower compartment with molded seat. Large in-hull windows bathe the master stateroom in natural light and provide outstanding views. 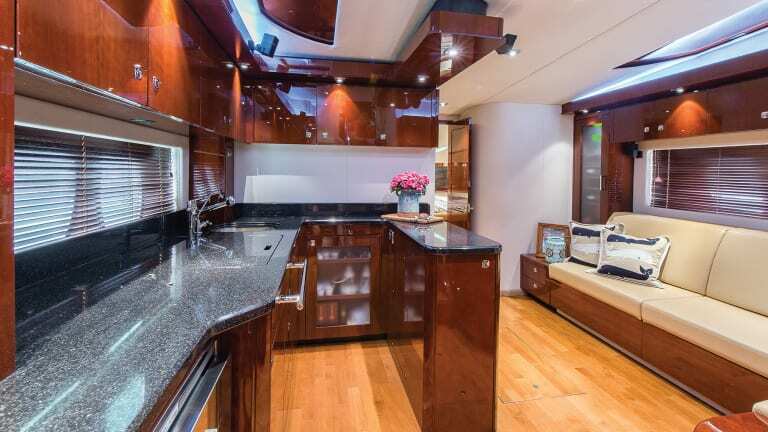 Here again, the high-gloss cherry wood cabinetry is used lavishly around the queen-size island berth. A chest of drawers is built in to starboard, cedar-lined hanging lockers are to port and starboard, and there’s a small seating area to port with a table—just right for a private, late-night snack. 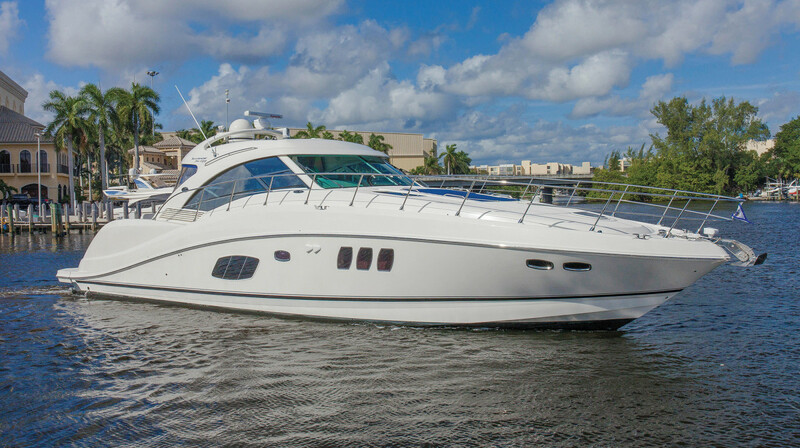 If you have an opportunity to inspect a 580 Sundancer, you’ll find that Sea Ray hit the mark with this sporty, luxury cruiser designed to satisfy an owner’s desire for style and substance for years to come.